When it comes to wine-drinking, it’s usually the grape, the year, or the price that comes into consideration long before the wine glass. But do a little thinking around the best wine glasses for your decor and your tipple of choice, and you’ll be rewarded with not only the expected – a good-looking tablescape – but occasionally the unexpected – better aeration for reds, or better-preserved bubbles for fizz, for instance. These our are pick of the best wine glasses (a reasonable amount of) money can buy. Enjoy these, then take a look at all our kitchen essentials. When it comes to choosing designs, we’ve looked to stalwart brands LSA International and Denby for elegance with a twist, and designers Julien Macdonald and Ella Sabatini for maverick takes on classic glasses. While we’ve made a note of which glasses are particularly suited to a full-bodied red, a crisp white, or an effervescent sparkler, ultimately it’s all down to you – sure, you might be able to get your nose around a fuller, more developed bouquet if you drink your New World red from a balloon glass (we’ve been practicing our wine chatter, can you tell?) it the design doesn’t make your heart sing, no-one’ll judge you for looking elsewhere. Add the Midas touch to your glass cabinet with a set of these gorgeous gold wine glasses. Those who own them have commented on how fine and elegant they are, and what a wonderful effect they lend to a dinner party table. They are reported to be on the delicate side, but with a little care, we’re sure they can continue to add a glimmer of glamour to your entertaining – or Thursday nights in a snuggie with a glass of Chardonnay – for years to come. If you find colourless glass a bit pedestrian, but don’t want anything too out there, consider these elegant balloon glasses by LSA International. With fine gilded rims and delicately tinted glass bowls, they come in a choice of sweet pastel shades, enough to add just a hint of colour to the tablescape without straying outside the bounds of elegance. The large bowl makes them ideal for red wines, but we’ve heard they also make a wonderful vessel for a gin and tonic. Users loved the versatility of these stemless wine glasses, saying they’re just as useful for milk as for Merlot, so if you’re low on cupboard space and want a set of glasses that does double duty, these might just be it. That said, they do look supremely elegant when used for their intended purpose, serving Pinot Noir and northern Italian varietal Nebbiolo at optimum aeration. 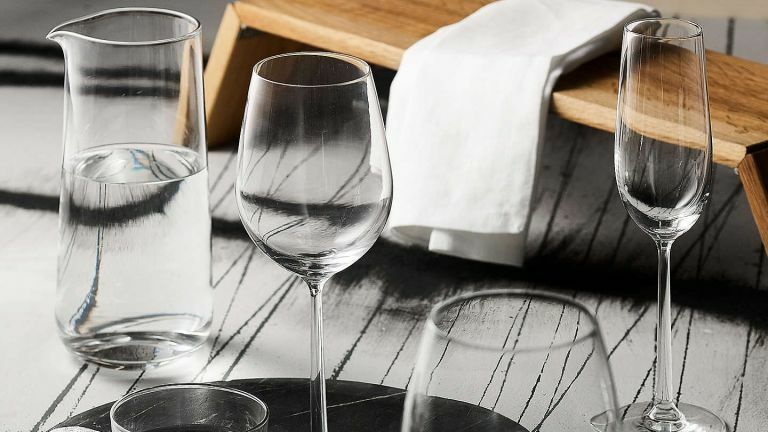 Whatever you choose to use them for, their minimal stemless design and very fine edge look fantastic on the table. If you’re in the market for some red wine glasses but aren’t sure about stemless, these smart glasses from big name Denby are a more traditional alternative – but that’s certainly not to say they’re boring. The slightly tulip-shaped bowl, with its curved lip, is a lovely twist on a regular rounded design, and the otherwise colourless palette is offset by the blue-green painterly touches on the stem, making for a delightfully unexpected-looking, but not unwieldy set of glasses. There’s not much you can do with the classic Champagne flute without going totally bananas right? Wrong. These crystal Champagne flutes by Ella Sabatini at Wayfair prove that there’s always room to put a twist on a classic, with their ever-so-slightly flared design and squared-off bottom cutting a dashing figure both in the cabinet and on the table. Not to worry – the narrow flute still ensures those all important bubbles won’t escape before you get to them. Not too dissimilar to the Ella Sabatini Champagne flutes, these wine glasses are fairly typical except for one standout feature, a quirky squared-off bowl, giving them a slightly retro look that’s far more high-end than the very small price tag would suggest. At just £12 for a set of four, they look far more considered than many similarly priced supermarket offerings, and if you happen to break one, it’s not the end of the world. If sparkling's more your scene, check out our list of the best Champagne glasses.